Fluid replacement for active individuals and athletes is under constant review for improvement. In order to perform at your best, maintaining adequate hydration is essential. Unfortunately, many athletes and those physically active are competing and exercising without proper fluid balance. The National Athletic Trainer’s Association (NATA) position statement on fluid replacement indicated more than 50 percent of athletes participating in professional sports, collegiate athletics, high school, and youth sports come to workouts lacking sufficient water intake. This is a problem but can be managed with the right fluid replacement strategies in place. Water intake is essential for the human body to function at optimal levels. Water is also a major component of the body with almost 73 percent found in your muscle tissue. It’s also distributed within and around your cells, and the fluid part of your blood. Water has an important job of keeping your body in balance (homeostasis) and is considered the most important nutrient in sports nutrition. You may be surprised to know fluid balance is maintained within a very small margin (+1 percent to -1 percent). When your body water is at 1 percent, you would be in a state of hyperhydration or excessive water intake. When your body fluid levels are at 3 percent, you’re lacking adequate fluid replacement (hypohydration). 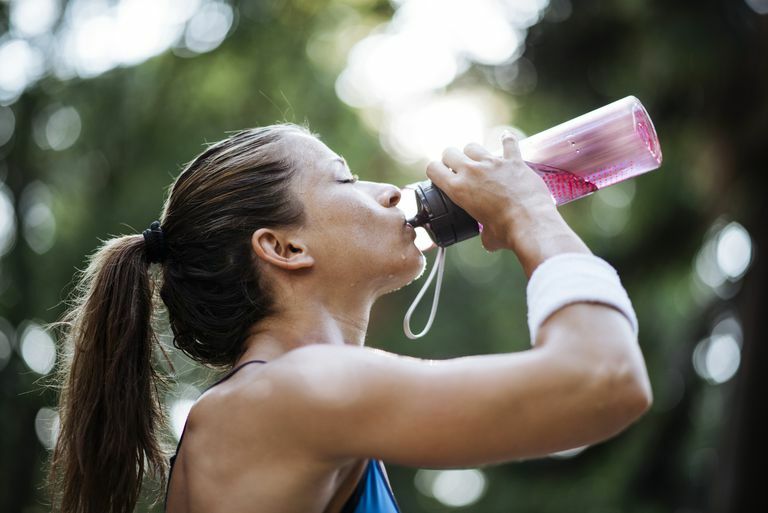 A large percentage of active individuals are exercising hypohydrated, which can lead to decreased athletic performance and increased health risks. Proper fluid replacement promotes the ability for you to remain within a normal body fluid range. The right fluid balance helps regulate heat properly, maintain cardiovascular function, improve exercise performance, and promote good health. What works best for you will be different for someone else, since body fluid losses and needs are individual. This is also the reason general fluid replacement guidelines may not be applicable to you as an athlete or an active adult. Other benefits of proper fluid replacement include maintaining athletic performance, regulating heat transfer, sustaining mental focus and mood, and supporting exercise recovery. Without adequate fluid intake, or even consuming too much water, you can compromise these benefits, according to research. It appears maintaining fluid balance means more than simply drinking a glass of water, especially if you’re physically active. Establish hydration protocols along with rehydration strategies specific to each athlete. Hydration protocols should be designed according to the sweat rate, sport, and environmental conditions of the athlete. Athletes should begin all workouts well-hydrated, and fluid replacement beverages should be accessible during training sessions. Hydration status assessments should be conducted on athletes prior to exercise sessions (e.g. charting bodyweight losses or gains before and after training and urine color tests). Ensure proper pre-exercise hydration: Athlete should consume approximately 17 to 20 fl. oz. of water or sports drink 2 to 3 hours before exercise, and 7 to 10 fl. oz. of water or sports drink 10 to 20 minutes before exercise. Fluid replacement should be based on individual sweat and urine losses maintaining hydration at less than 2 percent body weight reduction. This generally requires 7 to 10 fl. oz. every 10 to 20 minutes. Post-exercise hydration to correct fluid losses during physical training or an event should contain water to restore hydration status, carbohydrates to replenish glycogen stores, and electrolytes to speed rehydration. Rehydration is recommended to be completed within 2 hours post-exercise. Fluid replacement beverages should be consumed at a cooler temperature (50-59 degrees F). The Wet Bulb Globe Temperature (WBGT) should be ascertained for athletes exercising in hot environments to help avoid dehydration. Maintain proper carbohydrate intake as part of hydration and rehydration protocols before, during, and after exercise sessions or events. Athletic trainers and coaches should be able to recognize the basic signs and symptoms of dehydration (thirst, irritability, and general discomfort, followed by headache, weakness, dizziness, cramps, chills, vomiting, nausea, head or neck heat sensations, and decreased performance). Including sodium chloride (salt) in fluid replacement beverages should be considered when physical training exceeds 4 hours, inadequate access to meals or no meals are consumed, or hot environmental conditions. Adding 0.3 to 0.7 g/L of salt to hydration beverages is considered safe and reduces the risk of medical events associated with electrolyte imbalances (e.g. muscle cramps, hyponatremia). The sweat rate of individual athletes should be calculated (sweating rate = pre-exercise body weight – post-exercise body weight + fluid intake – urine volume/exercise time in hours). A simplified sweat rate method involves weighing prior to an intense one-hour exercise session and again upon completion of the one-hour session without hydrating or urinating within the one-hour period. Monitor the hydration status of an athlete exercising in a warm environment. Heat can alter sweat rate and individual fluid-replacement needs. Increased sodium intake may be warranted. Weight class specific sports (e.g. judo, wrestling, bodybuilding, rowing) should mandate a hydration status check at weigh in to ensure the athlete is not dehydrated. The evidence is currently insufficient to endorse the practice of hyperhydration by ingesting a pre-exercise glycerol and water beverage. Glycerol consumption side effects may include gastrointestinal distress and headache. Educate parents and coaches of child athletes on rehydration and the signs of dehydration. Minimize exercising in the heat and maximize time for a fluid replacement. Monitor and remove a child from activity promptly if signs or symptoms of dehydration occur. Large-scale athletic events require advance planning with ample fluid conveniently available. Hydration status should be assessed daily before athletes are allowed event participation. Be aware of unhealthy behaviors such as eating disorders and dehydration in weight class sports. Enough athletic staff should be available to ensure hydration is maintained at all venues. Euhydration – Having an optimal total body water content is regulated by the brain. The body systems function most efficiently in this state. Hyperhydration – Excessive total body water content. Consuming too much water. The body normally excretes excess fluids. Exercise-Associated Hyponatremia (EAH) – A fluid-electrolyte condition caused by a decrease in sodium levels, typically associated with persistent water intake, and during prolonged physical activity. Potentially fatal. Dehydration – The process of losing body water. Body water losses typically from sweating, urine, respiration, feces, or vomiting. Hypohydration – Body water deficit caused by acute or chronic dehydration. Athletic level assessment (mild to moderate = 2 percent to 5 percent and severe = >5 percent body mass deficit). Athletes with a deficit greater than 5 percent consistently present with impaired performance, extreme thirst, headache, and other symptoms. Severe fluid deficits are difficult to replace, even with extended recovery time. Drinking ad libitum – Drinking ad libitum (ad lib) means “drinking at one's pleasure.” Consuming fluids when desired and of the preferred concentration, flavor, consistency, temperature, etc. Drinking to thirst – Consuming fluids as thirst dictates. This strategy involves consuming fluids when thirsty and drinking enough to limit the sensation of thirst before and throughout the activity. All physiological body functions are influenced by your hydration status. The body will attempt to balance altered fluids lost through increased internal temperature and sweat, for example. Fluid losses coming from sweat are the primary reason for dehydration in the exercising athlete. If adequate fluid replacement is not consumed to offset the rate of water lost through sweat, progressive dehydration can occur. The goal as an active individual is to avoid scenarios like dehydration and maintain a state of euhydration. Calculating your sweat rate, which helps properly maintain hydration status and replenish fluid loss during physical activity. Assess your hydration status by checking body weight changes, urine color, subjective feelings, and thirst, which provides cues for needing to rehydrate. Athletes should start physical training sessions or events well-hydrated. Consuming 500 mL of fluid 2 hours before an event is recommended. Consuming a nutritionally balanced diet and fluids during the 24 hours before an exercise session or event is crucial. Athletes should restrict dehydration to not more than 2 percent of their body mass loss during intense exercise. Ideally, exercise-related body fluid losses should be replaced within a short time frame. Most individuals can avoid fluid-balance problems by drinking when thirsty during and after exercise and eating a healthy diet. Rehydrating during exercise, athletes should aim to drink fluid quantities equal to sweat and urine losses. A rehydration drink containing sodium, potassium, and CHOs may be helpful to maintain blood glucose, electrolyte balance, and athletic performance for training sessions lasting longer than 50 minutes. CHO concentration of the beverage at 4 percent to 8 percent (60g/1 L) is recommended to prevent slowing of fluid absorption rate. When access to meals is limited, athletes may benefit from carbohydrate (CHO)-electrolyte beverage to help maintain hydration status, energy, and electrolytes. Allow 5 to 10 days to acclimate to the heat. Athletes who are heat acclimated have fewer fluid deficits associated with dehydration. Avoid excessive water drinking during prolonged workouts (4 hours) to prevent water intoxication (hyponatremia). Rehydration beverage should include sodium, and fluid intake shouldn’t exceed sweat losses to avoid this condition. Consume a rehydration beverage containing both glucose and fructose after exercise to increase the fluid absorption rate. The amount of glucose in the beverage should be limited to about 2 percent to 3 percent (2 to 3 g/100 mL) to reduce the risk of gastrointestinal distress and maintain optimal absorption. Athletes suffering from medical conditions should consult their physician about hydration recommendations to avoid exacerbating their conditions. Educate athletes on the effects of dehydration on physical performance. Inform athletes on how to monitor hydration status. Convince athletes to participate in their own hydration protocols based on sweat rate, drinking preferences, and personal responses to different fluid quantities. Encourage coaches to mandate rehydration during practices and competitions, just as they require other drills and conditioning activities. Have a scale accessible to assist athletes in monitoring weight before, during, and after activity. Provide the optimal oral rehydration solution (water, CHOs, electrolytes) before, during, and after exercise. Implement the hydration protocol during all practices and games, and adapt it as needed. Finally, encourage event scheduling and rule modifications to minimize the risks associated with exercise in the heat. Is Organic Gatorade Really Better for Athletes?